You are currently browsing the category archive for the ‘Garden Nonbloggers’ Bloom Day’ category. The June Garden Bloggers’ Bloom Day has passed, so today let’s look at what’s blooming in your garden. Says Ginny, “Today is officially “Bloomsday” http://en.wikipedia.org/wiki/Bloomsday so if you’re going to post your pictures of your flowers, it’s extra-appropriate today. But if you’re going to host the nonblogging version, I don’t have much to show besides the ever popular pelargoniums and petunias. However, I do have a picture of something just short of miraculous. You know what a wretched winter we had? Well, at one point this pot with an Osmanthus that had survived two previous winters outside had six inches of solid ice in it. It got snowed on, then rained on multiple times, then frozen solid. The pot is so heavy I can barely move it in the best of circs, and it was frozen to the driveway, so I just left it and figured the plant was a goner. But look! Two shoots coming up from the base! 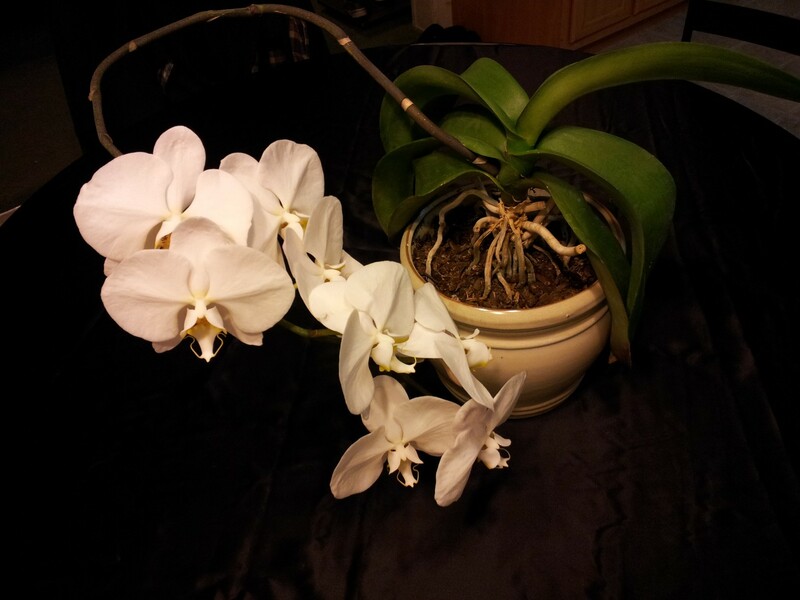 I am amazed and so happy that I didn’t kill it with neglect. 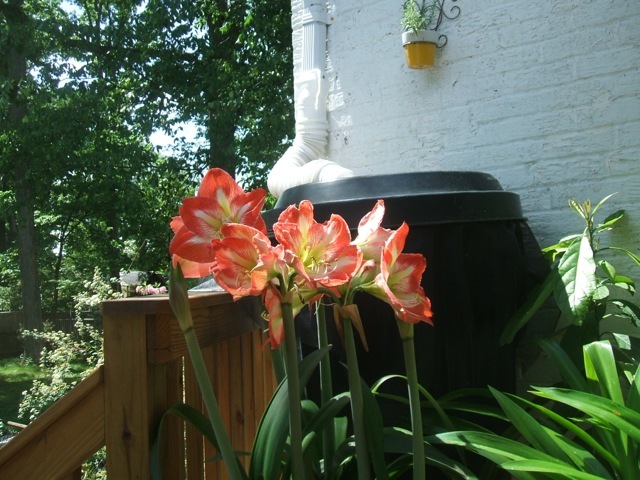 And here’s a pretty picture of the last of my amaryllis blooms. We had a big storm coming and I knew the flowers would get bashed around, so I cut them and put them on the kitchen window sill. I love the way the late afternoon sun illuminates them. Oooh – beautiful, Ginny! Good thinking bringing them indoors before the storm. Very nice. Also great news about your Osmanthus! Resilient little bugger! 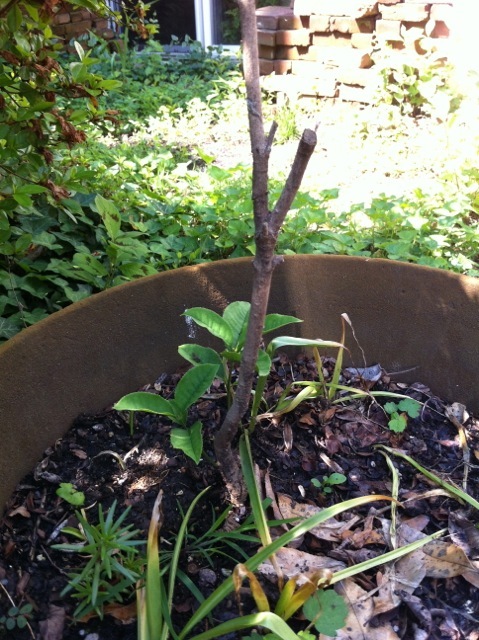 My Osmanthus will never see the great outdoors. Not because I’m worried about snow and ice, but because I’m worried our summers would be way too hot for him. It’s not worth the risk, as I enjoy the plant a lot. I didn’t really give you much notice to send me photos of your flowers, so that’s all we have for today. 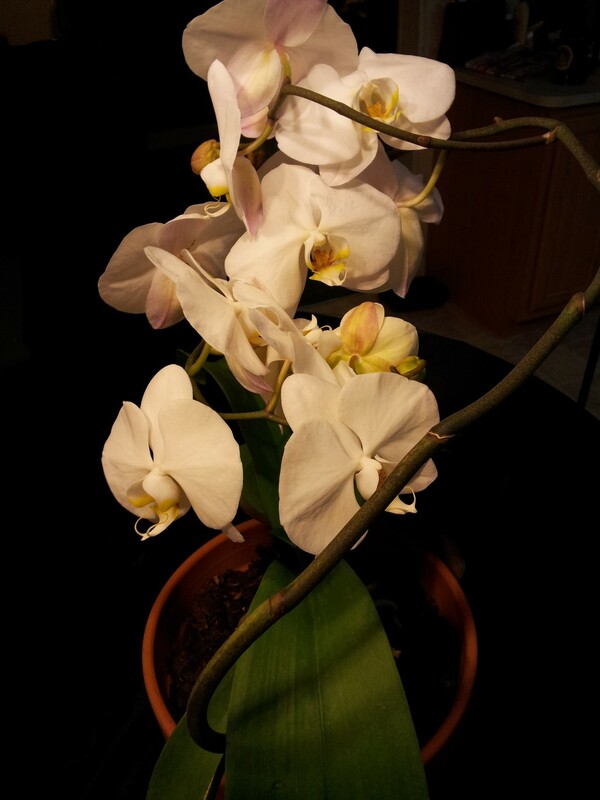 Thank you, Ginny, for sharing your lovely blooms. We’ll try another round in mid-July. 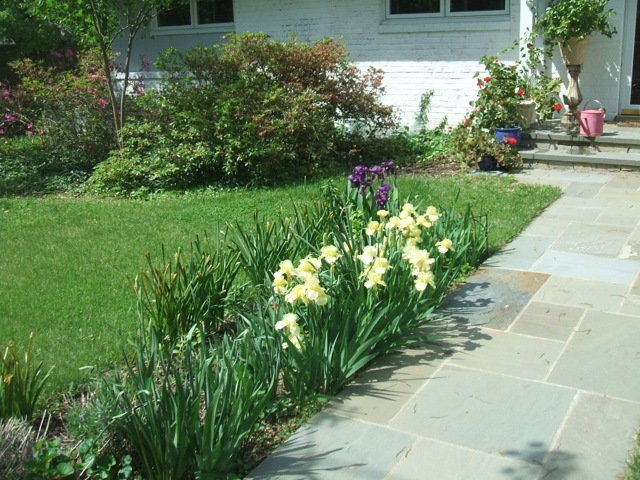 Now it’s time to showcase what’s blooming in the gardens of those who love flowers but don’t have their own blog, the April 2014 Garden Nonbloggers’ Bloom Day. This month we were lucky enough to hear from Ginny Burton, of Burton Optician in DC. I’m very pleased with the redbud. It was a volunteer that I nurtured for years. It looks pretty with the ancient weeping cherry (a natural weeper, not a graft) that’s doing its best to beautify our corner. Most of the dafs have bloomed out, but these must be a late variety. A window box on our kitchen deck. These are hiding the view of one of our compost bins and rain barrel. Thanks so much, Ginny! Your flowers are gorgeous! I enjoyed seeing what’s blooming in your neck of the woods. We don’t see too many redbuds out here so I appreciated that. That’ll do it for this month’s Garden Nonbloggers’ Bloom Day. I’ll be back tomorrow, hope to see you here. Hello peaches, let’s look at what’s blooming in your garden this February (instead of mine). 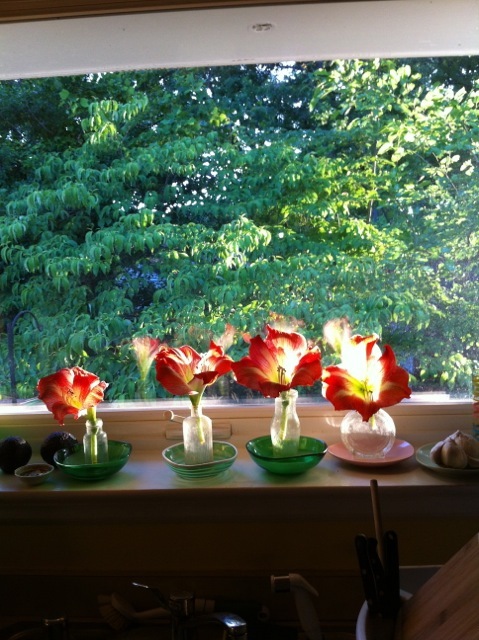 Nancy Mumpton of Phoenix sent me photos of her gorgeous flowers. Responding, indeed! They’re beautiful, Nancy! 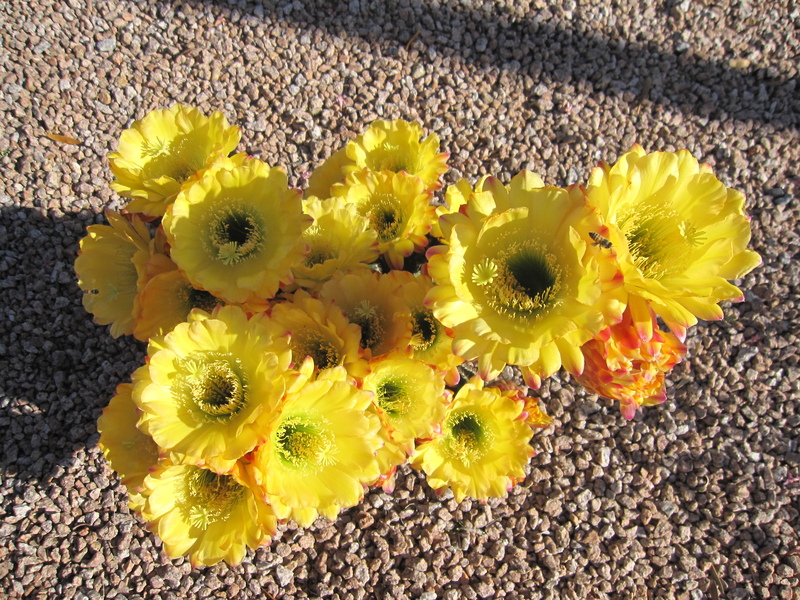 Most of the country is snowed in, so it’s nice to see your flowers from Arizona. Thanks so much for sharing them with us! We’ll do this again next month, so if you have flowers blooming that you’d like to show us but you don’t have a blog, send your photos to me and I’ll post them for you. That’s indoor and outdoor blooms. Leave your best guess in the comments section. The deadline is tonight at midnight MST (that’s 2am EST). I’ll reveal the answer and the winner(s) tomorrow. Imaginary prizes will abound for all who play. 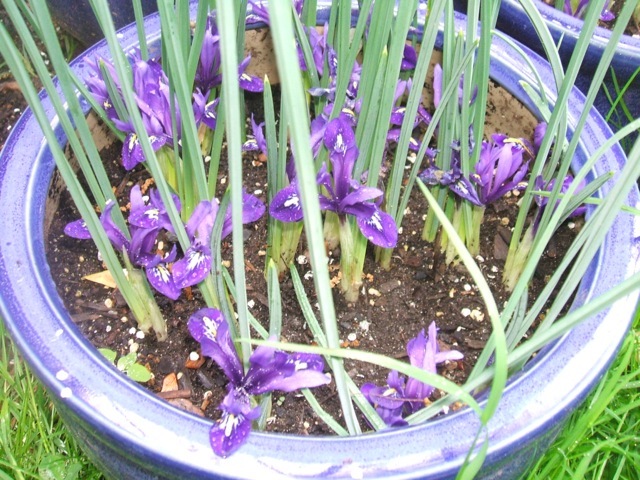 A little later than usual, let’s take a look at what’s blooming in a nonblogger’s garden. Specifically, what’s blooming at Ginny Burton’s (of Burton Optician) house in DC. Says Ginny, “ Hi Liza! There’s not much blooming chez moi at the moment. My poor daffodils were seduced by a long warm spell and came up, only to be blasted by the Polar Vortex, so now I have a row of mushy dead greenery lining my sidewalk. Gorgeous, Ginny! I’ll bet that tall Osmanthus smells heavenly. Lucky, lucky you! Thank you so much for sharing your photos, I appreciate it. And now it’s time to share photos of those gardeners who love flowers but who do not have their own blogs – the October 2013 Garden Nonbloggers’ Bloom Day. Swoon, Nancy! I don’t think I’ve ever seen lavender-tipped Datura (Jimsonweed) before – it’s gorgeous. And I love Lantana, too. I enjoyed your story of how the trumpet flowers were created to match the University’s colors – that’s very cool. Lovely flowers! Thank you so much for sharing them with us. This is my Alister Stella Gray rose which has climbed up 30′ Styrax japonicus and then flopped over to hang at nose height. A fabulous rose, very fragrant. In the background is my Franklinia, already changing color. I grew both the Styrax and the Franklinia from seed and planted them too close together years ago when I didn’t know any better. My 7 year old Osmanthus (almost reaching the ceiling) just knocked us out lately in perfuming the breezeway. We’d come home from work, open the door, and be overwhelmed by its scent. It smelled just like the white peaches that we bought this summer at the Westover Farmers Market. The bricks you see outside of the breezeway were collected (with permission of the builder!) from an old walkway and patio behind one of the 1950s houses that’s going to be torn down. I asked if they planned to recycle/reuse the bricks and if not, would it be okay if I dug them up and carted them off. Whoever made the patio did a superb job: bordered with timbers and set in a deep bed of sand, it was intact 60 years later. The bricks are heavier than modern ones — over 5 pounds each. I got 500 of them! When/if my energy returns, I plan to build some raised beds with them. Lovely, lovely, lovely. Zinnias are the best, aren’t they? So reliable, so cheerful. I’d really like to grow an Osmanthus of my own, but I haven’t seen any available in the Albuquerque area. But I’m going to keep looking for one. You always talk about the scent of the blossoms, so now I’m totally curious. Great score on the bricks! I hope you take lots of before and after pics of your raised beds and share them with us. I think it’s a fabulous idea to build your own. I’m looking forward to hearing more about them. 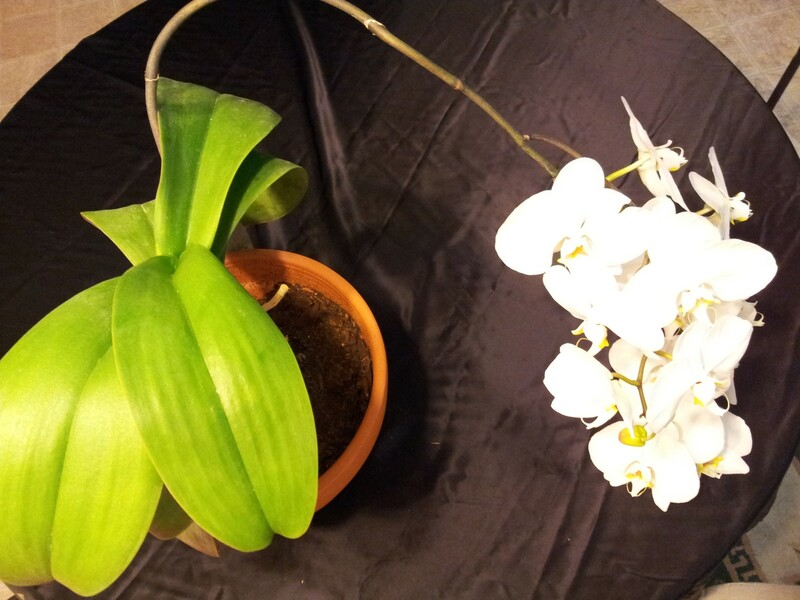 Thank you so much for sharing your flowers! That’s it for today’s Garden Nonbloggers’ Bloom Day. Thanks for staying with us. I’ll be back tomorrow, I hope to see you here. And now it’s time to showcase the beautiful flowers of people who don’t have blogs but still want to share their photos. Let’s start with the lovely Ginny Burton, of Burton Optician in DC. Says Ginny, “Well, the garden is pretty played out by now, due to lack of rain and my innate laziness. But the jasmine is blooming like mad on a pedestal by the front door — a fragrant treat for the mail carrier. I see now that the photo isn’t very good, but there really are lots of flowers! The zinnias continue to look so pretty (again, not a good picture). I found the tag for them. They’re Magellan Mix and haven’t had a bit of mildew on them, despite being so crowded in their pots. I got this Lantana for half price because it was so leggy. I like how intense the colors are. This ginger is 8′ tall with the blooms at nose level to the back porch. Unfortunately, it doesn’t seem to have a scent. They’re more coral colored than the picture shows. And here’s what’s left of my dill blossoms, complete with the swallowtail butterfly caterpillar that ate them! You’re welcome Ginny! Thanks so much for sharing your pretty flowers with us! And your caterpillar! Very nice! Thanks, Zach, for sending those photos to me. 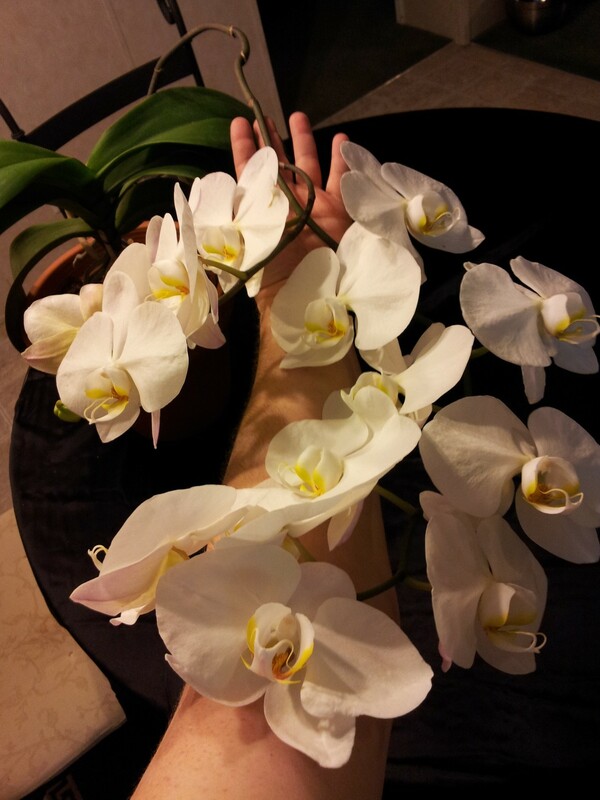 That was fun – I love seeing what other people have blooming around their houses. Thank you again for sharing your photos! I’ll be back tomorrow, hope to see you here! Thank you for sharing! What a great looking farm! Me, too, Nancy! They’re adorable! We also have contributions from Ginny Burton of DC. Says Ginny, <<<<Good old cannas! I got these in trade from GardenWeb a couple of years ago. They’ve multiplied so much, I’ll be offering these in trades this fall. Let me know if you’d like some! I saw a gorgeous stand of yellow cannas and yellow daylilies growing in a neighbor’s yard. I didn’t know who she was, so I wrote a note to the “Expert Gardener” at that address, asking if I could trade some irises for some of the cannas. She came over a few days later with a huge bag of them. Unfortunately, I didn’t store them very well over the winter because only a few came up. I’m hoping for them to spread! This is another GW trade: Yellow King Humbert. I think next year I’ll put them with the yellow cannas. I’m very proud of this: Franklinia alatamaha. I grew it from seed. I used to grow them easily, then one day read how difficult they are to propagate from seed and ever since I’ve been unable to grow a single one! They have all sorts of genetic problems because every existing Franklinia is descended from the ones that John Bartram gathered in the 1770s. Its flowers are like small magnolia blossoms and have a soft lemony scent. Nicely done, Ginny – you should be proud. Such pretty flowers! 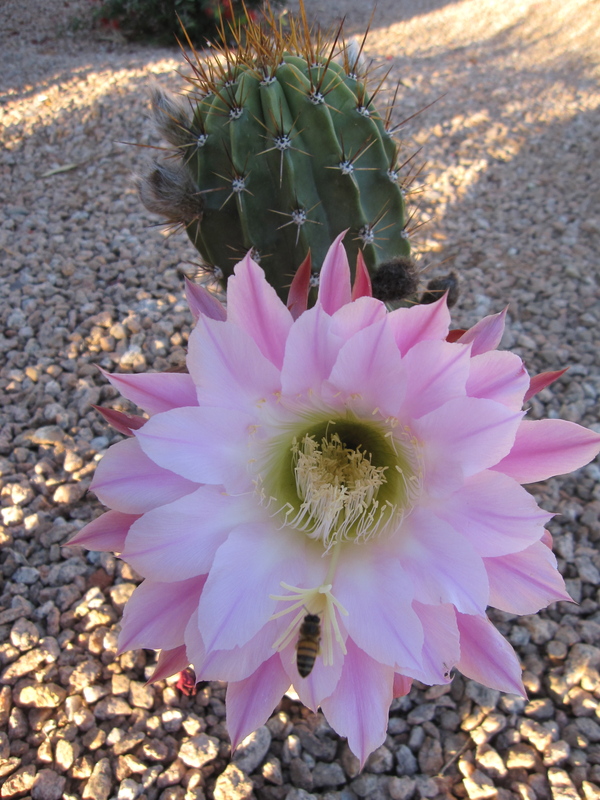 Thanks to all of you who submitted photos of what’s blooming in your gardens. I appreciate it! Now it’s time for photos from my readers’ gardens, a couple of readers who don’t have blogs of their own. Beautiful, Nancy! 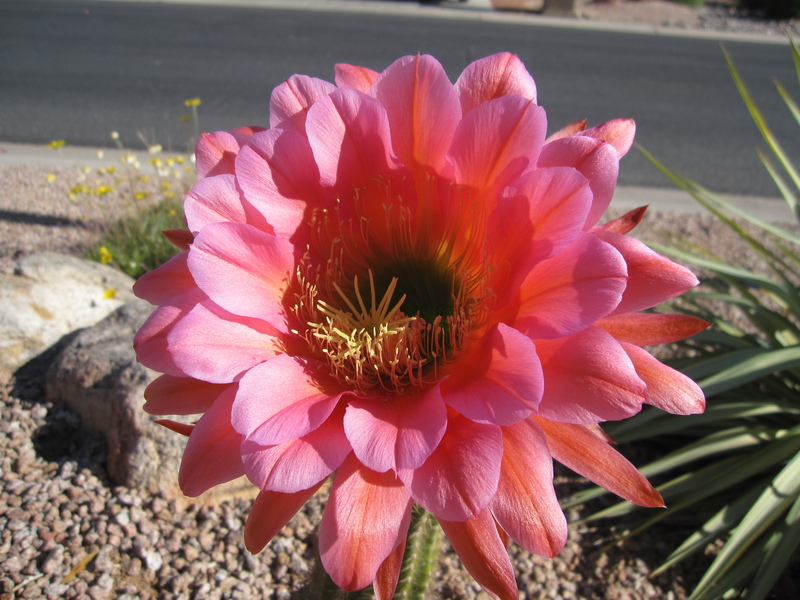 Thank you for reminding us that there are plants that can survive the brutal heat of Arizona! The desert is not void of color and vibrancy. I love it! I don’t have anything blooming inside, but these are new since NBBD two months ago. Zinnias, the best I’ve ever had. I lost their tag, so I don’t know the variety, but there has been zero powdery mildew. Hmmm…not sure why the font changed, and it’s not letting me fix it, so sorry about that. Regardless, those are some gorgeous flowers, Ginny! Thank you for sharing. Flowers from opposite ends of the country – how lucky are we to get to see a glimpse into these gardens? I’m thinking pretty lucky. Thank you to both of you ladies for sharing your photos. If you love to garden but don’t have a blog, consider sending me flower photos next month and I will post them the day after the Garden Bloggers’ Bloom Day. Starting tomorrow, I’m going to share photos of Albuquerque public art – just photos I’ve taken of stuff around town, mostly murals. I’ll be out of town myself, for some much-needed r-n-r, so the photos will be on an automated publishing schedule. I work hard to lure you to come back day after day, so instead of abandoning the blog while I’m gone, I thought the photos would be a nice way to “communicate” in my absence. Please feel free to share your thoughts about the art. I’ll also have the winners of the plant puzzler on Friday, so be sure to cast your vote if you haven’t already done so. I’ll catch you on the flipside! Today I’m hosting the May 2013 Garden Nonbloggers’ Bloom Day, for those readers who want to show off their flowers but don’t have a blog of their own (or who do – anyone can join in). I love it. Living in Albuquerque, I’ve been telling people in other parts of the country that we’d send them spring just as soon as we were done with it. It’s nice to see the photographic proof of it happening. Also, I really enjoy seeing other people’s gardens and flowers. I hope you do, too. Let’s start first with Nancy Mumpton, who lives in neighboring Arizona. Nancy, those are gorgeous! It never ceases to delight me that soft fluttery flowers can come from such menacing looking cacti. Another good reason not to let thorns stand in the way of falling in love. 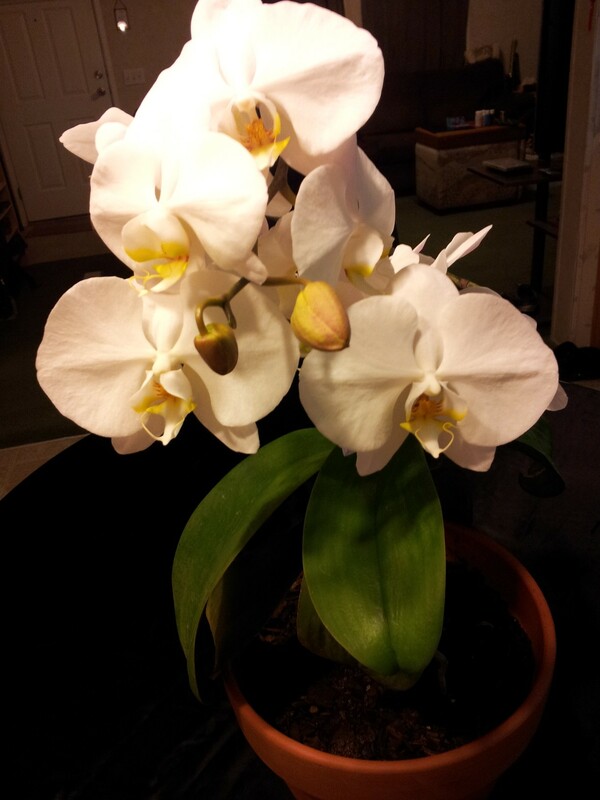 Thanks, Nancy, for sharing your blooms! Next up is everyone’s favorite DC-area Optician, Virginia Burton. Above the kitchen sink. That’s where I put all the flowers that I’ve found broken off by people’s stupid dogs or that have flopped over onto the sidewalk or into the street. Plus the three tomatoes that my husband plans to plant as soon as the weather warms up consistently. Ginny>>>>Lovely, lovely! To be fair to dogs, though, maybe it was stupid kids who broke the flowers off. Haha, juuuuust kidding! Children are precious angels. Ginny, your back porch looks so inviting. I love how green your part of the country is – there are so many trees around DC and Virginia. It’s a pretty, pretty area. And it looks like you’re doing your part to add to its beauty. Nicely done! 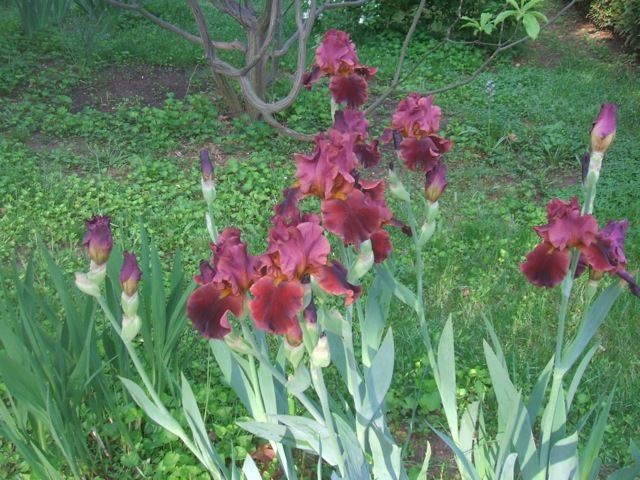 We finished with our Irises a week or two ago, so it’s nice to see yours. Thanks for sharing! If you’d like to send in photos of what’s blooming in or around your casa, you can email your photos to me at lizatheplantlady@gmail.com. I’ll post them on the 16thish of each month, the day after the Garden Bloggers’ Bloom Day. I’ll be back with an all new Ask the Experts panel tomorrow, along with puzzler action. Hope to see you back here.